Ok, so I'm bad at holidays. I should've written this last night but instead I was working on the second Awesome Jones novel and watching the Dodgers and thinking about an upcoming post about Game of Thrones and Bleak House. Father's Day wasn't really on my mind. I did manage to order a present for my dad but it won't get there until like Tuesday. Anyway, my dad is a huge part of why I'm into Trek and, really, why this blog even exists (such as it is these days) so it's only fitting that I should write a post about the dads of Star Trek. The folks in Star Trek tend to have rather complicated relationships with their dads. I get it. My dad and I are about as close as we can get given who we are and our past together. I've written about that before. So, in honor of father's day, here are a few episodes that showcase some of the great (and not so great) dads of Trek. It seems like I write about this episode all the time. I love this one. DC Fontana's telling of the complicated, bi-cultural, bi-racial, father-son relationship between Spock and Sarek laid the groundwork for so much of Spock's character. Sarek is stoic, cold, a little snarky and quintessentially Vulcan and Spock tries as hard as he can, in spite of his human blood, to be just the same. It's a family drama wrapped up in a murder mystery and served with plenty of festive neon food cubes. Sometimes all you have is your dad's legacy. But, sometimes a man's legacy can cast a longer shadow over you than the man ever could. I don't know how many times the phrase, "Worf, son of Mogh" is uttered in Star Trek but, man, last year it seemed like I heard it every five minutes. In Sins of the Father and Birthright, Worf has to face with his father's possible wrong-doings and then take them upon himself. In Birthright, he gets to the bottom of what really happened to his father and some of the other Klingons at Khitomer. From the beginning of DS9, Nog sets out to better himself through education and, for a long time, we don't really get his motivation. Then, in Heart of Stone, when no one takes his dream of joining Starfleet seriously, he finally confesses that he doesn't want to end up like his father. The speech he gives Sisko is beautiful and heartfelt and perfectly portrays the complicated ways our parents' decisions effect us. In Facets, we see the other side. While Dax is getting her past-life on, Quark attempts to sabotage Nog's Starfleet entrance exam and Rom catches on. This usually timid dad isn't about to let Quark mess with his kid's chances at a better life and his fury is sweet and justified. We've known since "Sarek" that Spock's dad is fighting a losing battle with Bendii Syndrome. The decorated ambassador has always been closed off toward his son but, so close to death, he reveals his complicated emotions regarding Spock. 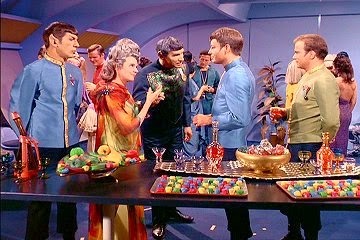 I love Sarek and I love every Sarek episode and this one is no exception. The Sarek/Picard combo is a beautiful thing. Alright, I get that a whole lot of folks hate Naomi and a whole lot of other folks hate Neelix and this bothers me not at all. I love both of these characters and, while Once Upon A Time's goofy holosuite characters can be a little much, the emotional undercurrent of this one more than makes up for it. Neelix is Naomi's god-father and he's read her to sleep since she was a teensy baby. Naomi's mama is a busy science officer and when her shuttle gets caught in an ion storm and no one can reach her, it's up to Neelix to break the news to Naomi and then take care of her in her time of great need. Sometimes your mom is your dad. In the case of Voyager, Janeway is pretty much everyone's single mom and she parents her crew through seven years of Delta Quadrant craziness. In Hope and Fear, it looks like they might finally have a means of escape. They'll be back in the Alpha Quadrant in no time! Everyone's excited--except Seven, who isn't sure she has any business on Earth. Janeway and Seven are at cross purposes through this entire story but, when they're stuck together on an alien bridge, Seven's emotions are revealed and Janeway is there for her. Welp, I pretty much saved the best for last. This is the ultimate Star Trek daddy-sode. 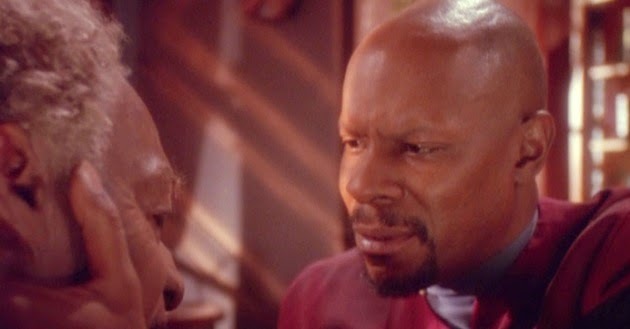 Benjamin Sisko is a pretty great dad (most of the time) and nowhere in DS9 is this showcased more than in The Visitor which always, every single time, never ever fails to make me ugly cry into my pillow. If you only watch one of these episode today (or ever) watch this one.